There is no one answer that applies to every individual and there can not be specific solution that can be applied to each individual But many people fail to note the distinction between fatigue-physical tiredness -and sleepiness, the inability to stay awake. It’s possible to feel tired physically and still be unable to fall asleep because while your body may be exhausted but you don’t feel sleepy. To fall asleep, you need adequate time to unwind, even if you feel fatigued. It’s not so easy to simply turn off. Is it too difficult for you to fall asleep at night? 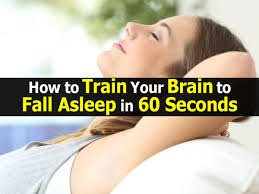 Ans is big NO.You should try the 4-7-8 breathing technique that claims to help you nod off in 60 seconds! It sounds great, right? Method has been pioneered by Harvard-trained Dr Andrew Weil who studies meditation, breathing, and how it can be used to counteract stress. It lets oxygen better fill the lungs, calms the mind and relaxes muscles. This method is great for more than just falling asleep though. In the moment when we are stressed, our endocrine system releases adrenaline through our adrenal glands. This elevates your heart rate, and can make you feel jittery and unwell. It makes you breathe rapid and shallow. But, using this breathing method, you counteract the natural effects of adrenaline and your body is forced to slow down your heart rate. It doesn’t have a choice! At the beginning, you may feel a tad uncomfortable. After a while, you really do feel your heart rate slow and your mind clear. So, why don’t you try this tonight and tell us what you think?